1992 Bridgestone MB-4: Free bike = FIGHT! Who, us? How did he know? And how did he know that we had just freed up some space in the dining room bike shop so we could accomodate one more steed? 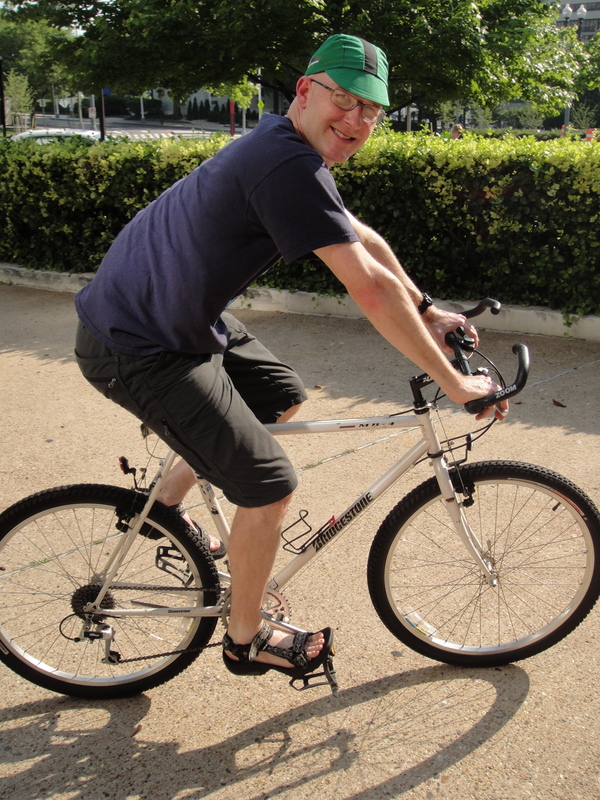 Felkerino asked him what kind of bike it was and our friend said, “Oh, it’s an old Bridgestone mountain bike.” Hmmm. That piqued our interest, but we tried not to give it too much thought. When we picked up the bike, we discovered it was a 1992 Bridgestone MB-4 in pearl white. It was kept in a loving home and does not appear to have many miles on it. Most of the parts, which include a lovely Sugino crank and Shimano Deore gearing, are original. We were so excited about my Felkerino’s our new bike, that we immediately pumped up the tires and took turns spinning gleefully around the parking lot. While the MB-4 is not among the most prized of the Bridgestone models, the pearl white frame is pretty and the ride feels good. Plus, it was really cool that our coffee connection thought of giving this bike to us. Sometimes serendipitous things like that happen and those are fun moments to treasure. After treasuring the serendipity, I started eyeing Felkerino suspiciously. “He doesn’t really need that bike. I need that bike.” I knew he was thinking the same thing about me. Don’t ask me how. I just knew. It was generosity and good luck that got us this bike in the first place. We decided the Bridgestone is something we can share. Our measurements are fairly similar as is our enthusiasm for the bike. Wait, someone’s giving away Bridgestones? Where do I get in line? I have an ’89 MB-1, but unfortunately it’s not in good condition, unlike your (plural) MB-4. Share and enjoy! Some days you get lucky! Still cool to have an MB-1, though. We are happy to add the MB-4 to the stable. I have a hard time sharing desserts with my husband. I realize desserts are different than bikes but sharing is sharing. As our marriage evolves I’ve learned to share my desserts with him. What I’m really trying to say is I’ve learned to grab a BIGGER piece of dessert so when I share with him I do not feel cheated. My advice to you is to figure out how to share the bike without feeling cheated – maybe you can sneak in a ride when Ed’s napping, working or otherwise not paying attention. Good Luck! I agree, sharing is sharing, and I like your system! I definitely work in some good rides on this bike :)!! Great bike! I have a very similar one. Broke a GT Karokoram frame back in the early 90’s, found the pearl white MB-4 at a LBS, move all the drive & steering stuff over and put on some Quadra Rock Shox with a Scott bullhorn handlebar and old school shift levers (never ever broke one) . The goal is to get back on the trails this year after a number of “road years”. Maybe a race or two. I hope there’s a “vintage” class. 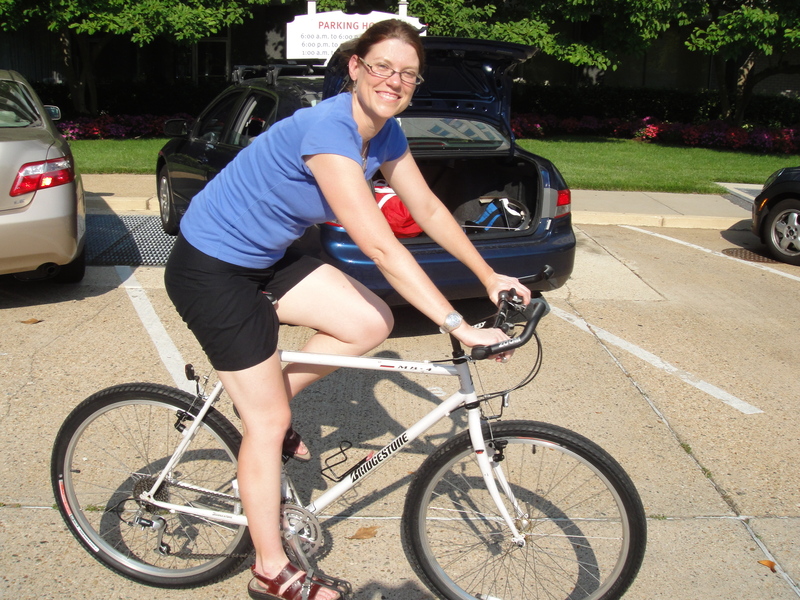 For a couple of years my wife road this bike with some fat road tires….I bought her a road bike so I could have it back. Have fun!! I realize that by now, this is an old post, but I just have to say that’s a beautiful bike! My own personal Pearl White MB-4 is no longer very pearl but it is still very much loved. Over the years it has gotten upgraded to 8-speed XTR w/ V-brakes. Still has the original Sugino Cranks and Ritchey stem. Last year I put the rigid fork back on it after my RockShox Mag21 finally passed away. And I fell in love with the bike all over again. I still ride it about 40 miles a week. Yeah, the bike is great! Glad you have kept yours in service. Felkerino loves using it with our Burley trailer for grocery runs. Last June I picked up a black 1990 MB3 for $55 on Craigslist, which is almost like having somebody give it to me, isn’t it? It wasn’t quite pristine, but I did a complete overhaul: powder coat, decals from Velocals, new chainrings, cogs and chain, headset and saddle. I added fenders, street tires and dirt drop/moustache bars. It’s now my Grant Petersen tribute bike, and my daily commuter. Just started following your blog. You must have a large dining room!. Thanks for reading the blog. Sounds like a great find and a cool bike! Regarding the Dining Room Bike Shop… somehow it keeps expanding to accommodate our various bike projects.